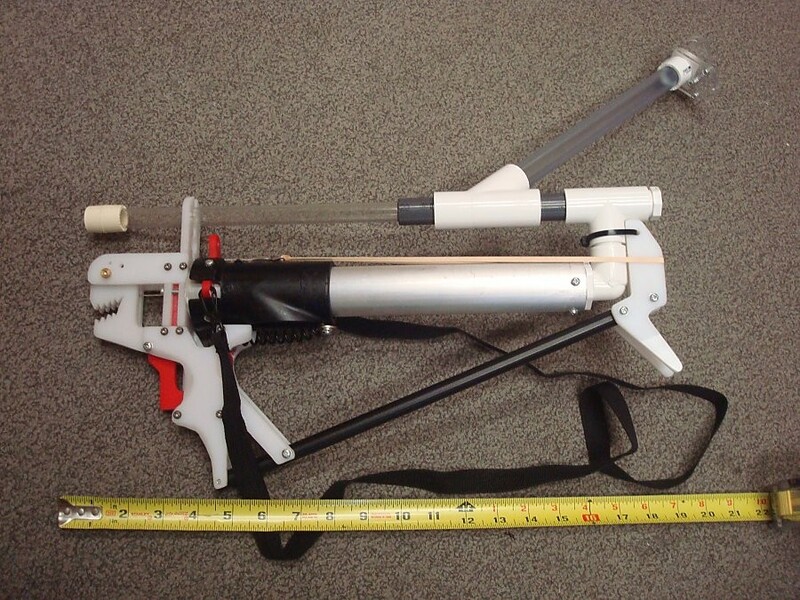 Full-length K26 blaster with a 12-inch plunger tube, 6-1/4" draw, and a hopper. Total length is 19 inches. It's a normal Rev.3 Plusbow catch only in reverse because the catchplate is ahead of the frame plate. The end of the plunger is a rod clevis holding the eyelet of a 1/16" braided steel lanyard. The lanyard loops around a pulley and back through the eyelet of the priming shuttle. The slack in the cable whether primed or not is held tight by a rubber band to prevent whipping. The shuttle is returned to the forward position by a bungee, so it's a non-reciprocating handle. I had originally intended to use a side-mounted handle, but this setup with a shoulder strap ends up working way better. With the strap looped around the opposite side of my neck then back forward under my right armpit I can prime the blaster by just pushing forwards on the grip by 6-1/4 inches. Returning the stock to the well of my shoulder allows the shuttle to slide forwards to its resting position. In the end I now have a full draw K26 blaster that I can completely utilize with only one hand. Reloading the wye takes place right in front of my face with the blaster hanging from the shoulder strap. 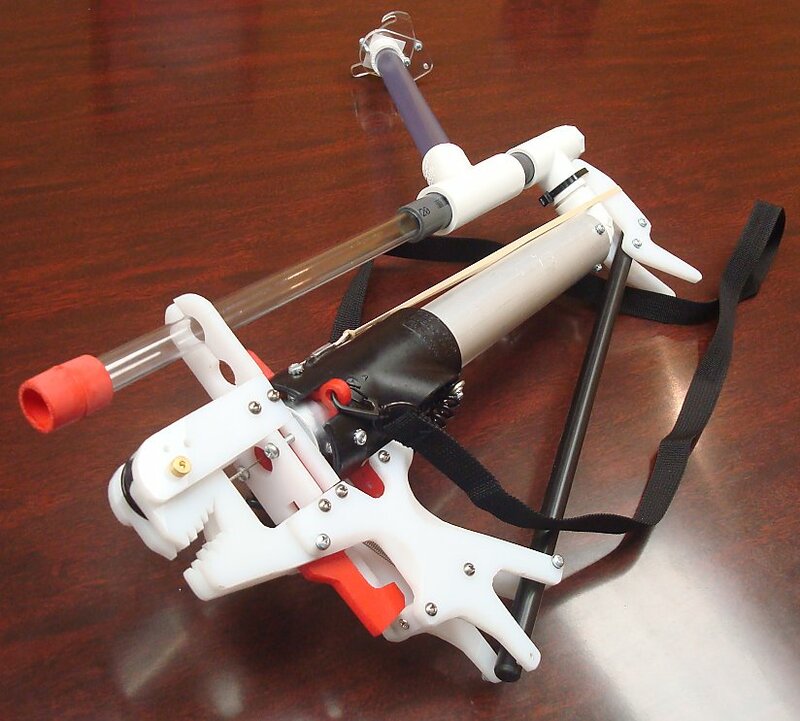 The tee is there in the event that I want to single this blaster and breech-load the barrel using a hole door. Will be updated with a full template set and partlist this weekend. Edited by CaptainSlug, 08 August 2016 - 06:34 PM. This performed much better than I was expecting it to at Apoc and I ended up using in a third of the rounds throughout the day. The only issue I had was the hooks on this particular shoulder strap are too small and were bending over time. They came unhooked once or twice and I had to reverse them to get it from happening again. I'll need to switch to more robust hardware. It was also very amusing to have to demonstrate its function to everyone as it befuddled pretty much everyone that looked at it. No amount of explaining functioning was a substitute for them just seeing it work. Unfortunately I did not get to take a video of the function while at the war. So here's one from tonight. Edited by CaptainSlug, 08 August 2016 - 06:36 PM. Now I get it. Should we expect plans soon? I don't see how it's function could befuddle people it's relatively simple. 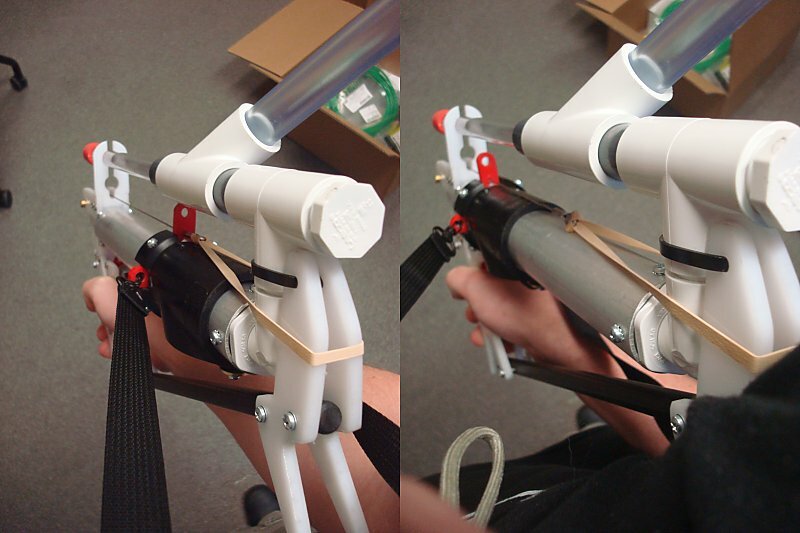 Instead of a 2 handed pump action, you prime it with a punching motion (due to the sling) the external spring is just a return spring to help reset the priming handle. Best Reddit comment so far involves making a pair of these into a Manta Ray. That's just so retarded that I'm going to have to add it to my to-do list.  Template set and partslist have been added to the first post. Do you have any numbers on how much mechanical advantage the pulley gives you? Also, do you think it could be easily incorporated into other designs? There's no mechanical advantage with a single pulley. You would need two pulleys in order to get one, and the downside to adding more pulleys is that for every factor increase in advantage you inversely increase the travel distance required to hit your stroke length total. The load factors DOWN, but the reel-out distance factors UP. This is the same trade-off you get when working with levers where you are trading load for distance. A 2 pulley gun tackle for a 6-1/4" stroke piston at a 28 pound spring load would require that you pull 12-1/2 inches of cable at a maximum of 14 pounds. A few of the currently available "bow" blasters that Nerf sells seem to be using a similar system. This setup could be used in an identical way where you are pulling on the cable itself taught between bow arms. You could either knock the cable into a catch, or hold it elastically like I am here and use a catch plate on the plunger. The only purpose of the cable in this design is to redirect the "primed length" of the plunger rod back towards the user. 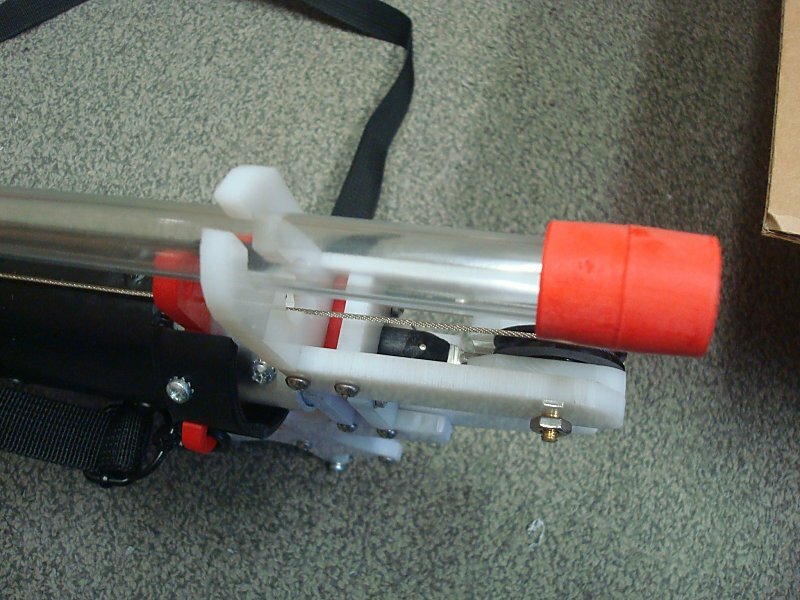 That way the overall length of the blaster remains constant whether it's primed or not. This system could easily be adapted in a variety of ways to make other shapes/configurations more feasible. But it's all a matter of trying to find one that's still ergonomically reasonable to use. And with all of that said I'm now picturing a horrible nightmare bow with a plunger tube as one bow arm and the dart hopper as the other. And the barrel somewhere in the middle.